Posted on January 12, 2018 by staceyanderton1	in Alumni, News and tagged Math and Science club, Saegertown High School. Saegertown alum Joe Braymer, who is a chemist in Germany, returned to share his experiences with the chemistry students in Mrs. Kelli Peters’ classes on Dec. 20. On Dec. 20, Saegertown High School chemistry students had the opportunity to learn about what they could do in the science field from alumni Joe Braymer who graduated from Saegertown in 2004. Chemistry teacher Mrs. Kelli Peters organized his visit. She contacted Braymer through his mother, who she sees often during the summer. “It’s nice seeing how successful our kids are when they leave here,” Mrs. Peters said. Mrs. Peters was aware that he was doing research, and even being a chemistry teacher could not prepare her for the kind of research he does. “It’s way beyond me,” she said. In the future Mrs. Peters would like for him to come back to talk more about his research, and to talk to Mr. Greco’s advanced biology class as well. After his graduation from Saegertown, Braymer went to Edinboro for his bachelor’s degree in chemistry. Then he moved to Ann Arbor, Michigan to attend the University of Michigan for his doctoral degree in organic chemistry. While he was getting his PhD, he began to do his own research at Michigan where he researched the development of small molecules that could be used to treat Alzheimer’s Disease. After receiving his doctorate, Braymer attended Indiana University Bloomington for his post-doctoral research position to expand into biochemistry. Braymer mainly works with yeast cells which serve as a model cell for understanding human physiology. Braymer hopes that in the future his research could create medicines to help correct metabolic disorders. “I look around me, I see colors, I see lights and I really want to know why something is red or has a certain form. That’s chemistry. I want to know why things are the way they are,” said Braymer, while talking to students in Mrs. Kelli Peters’ class about why he became a chemist. Being a Saegertown alum, Braymer has some fond memories of high school. “What I remember most about Saegertown is wrestling. I wrestled every year and although I never reached my goals, I learned a lot about myself through wrestling,” Braymer said. Posted on November 30, 2017 by staceyanderton1	in Alumni, Archive, Column, Entertainment, Features, News, Opinion, Sports. Posted on February 17, 2017 by staceyanderton1	in Alumni, Archive, Entertainment, Features, News, Opinion, Sports. Posted on November 22, 2016 by staceyanderton1	in Alumni, Archive, Entertainment, Features, Media, News, Opinion, Sports. Posted on November 4, 2016 by staceyanderton1	in Alumni, News, Sports and tagged #AlwaysAPanther. The chant “We’re glad … you are … a Saegertown Panther” echoed through the Saegertown Junior-Senior High School auditorium at the kickoff of “Shawn Morelli Day” on Thursday. A full day of activities took place to welcome home and celebrate the 1994 Saegertown graduate who recently won two gold medals for cycling at the Paralympics in Rio. Morelli continued her education at Penn State and Webster universities in 1998 and 2001. After receiving her master’s degree, she became an engineer officer in the U.S. Army. During her time in the military, she enjoyed the camaraderie that came with serving her country. Shawn Morelli is a two time Paralympic gold medalist and a 1994 Saegertown graduate. “You just meet people who will always have your back no matter what,” Morelli said. While serving in Afghanistan in 2007, Morelli was injured by an improvised explosive device. She suffered neck and nerve damage, traumatic brain injury and permanent blindness in her left eye. Morelli started cycling as part of a rehab program in 2009 and now has a total of six world championship cycling medals as well as the two golds she won in Rio in September. Morelli’s story is a story of hope. To stress the importance of that message, Morelli donated her first world championship jersey to the school. It will be displayed in a showcase at the school. Keeping with the theme of overcoming obstacles, during English classes earlier in the week, all students wrote about obstacles they had overcome or were working to overcome. Morelli presented the school with her first World Championship Jersey. It will be displayed in the Panther Hallway. Thirty students were selected by teachers to join Morelli and principal Tom Baker on stage. They received shirts with the motto: “You wish … you were … a Saegertown Panther” and that’s when the cheering started. With Baker leading them, students and staff cheered Morelli, each other and their community. Morelli also visited Saegertown Elementary School, where the students chanted “USA” to welcome her into the the gym. She spoke briefly with students, answered questions, shook hands and gave kids the opportunity to see her gold medals. After the assembly, Morelli spent the day touring the school and visiting with anatomy and biomedical engineering classes discussing her injuries, how she dealt with them, and the composition and functions of her bike. Her road bicycle is specifically designed to allow her to compete with full control of the gears on her left side and is custom made for her body. She also attended a press conference hosted by the staff of The Panther Press, Saegertown’s student newspaper. In one lighthearted moment, broadcast director Ben Haylett showed Morelli her 1994 senior picture. She noted that she was wearing her favorite Mickey Mouse sweater and that she still loves him. Students also learned that she is a history buff, likes to read science fiction and has a dog named Roscoe. Throughout the day, Morelli challenged the students to create family from their school community. “Are you willing to step out of the ‘in-group’ and bring people in to create a real student body family where you feel safe and supported when you walk in the doors to school?” she said. This story was originally published in The Meadville Tribune on Nov. 4, 2016. Posted on October 7, 2016 by staceyanderton1	in Alumni, Archive, Entertainment, Features, News, Opinion, Sports, Uncategorized. Volume 11 Issue 2 was released Oct. 7, 2016. Click here to read. Posted on June 6, 2016 by staceyanderton1	in Alumni, Archive, Features, Media, News, Opinion, Sports, Uncategorized. Volume 10 Issue 7: Senior Issue 2016 (Click here) was released on Monday, June 6,2016. Posted on December 22, 2015 by staceyanderton1	in Alumni, News, Sports and tagged anatomy, Mr.Bidwell, traumatic brain injury. After finishing a chapter learning about the brain, the anatomy class recently had a guest speaker visit on Dec. 1. The class took some time to focus on paralysis and how it affects the body after a traumatic brain injury. Paralysis can be explained as the loss of muscle function in your body because messages from your brain to the muscles are not delivered. “I think it’s important to know what causes paralysis if they are in anatomy class, but not the details of paralysis,” said Mr. Chris Greco, the anatomy teacher. On Dec. 1, Math teacher Scott Bidwell spoke to the anatomy class about his paralysis due to traumatic brain injury. The class’s guest speaker is a member of the faculty here at Saegertown. At age fifteen, math teacher Scott Bidwell’s life changed dramatically after a detrimental play in a football game against Lakeview High School. After multiple surgeries, it was unknown if he would be paralyzed for the rest of his life. “It was a killer kickoff, which means go right for the ball. It was rainy that day and as he juked, I jived, hitting him in the femur bone, breaking it while crushing my fifth vertebrae,” said Bidwell. This ties in with the class’s recent discussion about paralysis and Greco enjoys listening to Bidwell speak to the anatomy class year after year. “I think that students know what it is, but they don’t know the significance of it and what it can do. And, the challenges someone faces with paralysis,” said Greco. Posted on October 5, 2015 by staceyanderton1	in Alumni, News and tagged #spiritweek. Student council encourages all students and staff to participate in Spirit Week. Spirit week kicked off today with a display of flannel shirts and pink to celebrate the final day for Principal Doug Wilson. On Tuesday, wear tie dye. 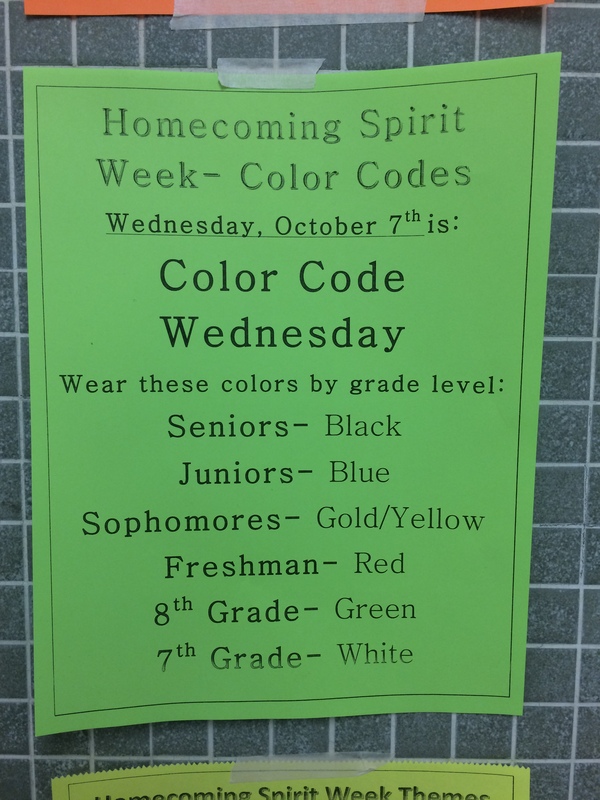 Wednesday, wear the assigned colors by grade level. On Thursday, dress as a fan of your favorite TV show, and on Friday, dress head to toe in blue in gold. For more information, papers are posted around the school. Following Friday’s pep assembly, the football team will take on the Maplewood Tigers at 7 p.m at Cannon Memorial field. The formal homecoming assembly will take place October 7 in the auditorium, starting at 10 a.m. “Students can vote for homecoming king and queen Thursday, October 8 during history classes,” said Jacob Perrett, student council president. All the homecoming candidates are ecstatic to take part in this special week.. “I’m super excited to just have a fun time. I think we have a good group of students,” said McKenzie Ashbaugh. The king and queen will be announced before the game Friday night, and the dance will be Saturday from 7:30-10 p.m. in the gym. Cost is $3 per person and $5 for a couple. Posted on December 4, 2014 by staceyanderton1	in Alumni and tagged Homecoming, Military, SHS. Logan Weed, junior, reunited with his brother Jordan Weed. On Wednesday Nov. 26, Mr. Scott Bidwell’s seventh period Algebra class was continuing as any normal class day would for junior Logan Weed. However to Logan’s surprise, the class ended with a shocker he never saw coming. His brother, Jordan Weed, had returned home for the holidays. 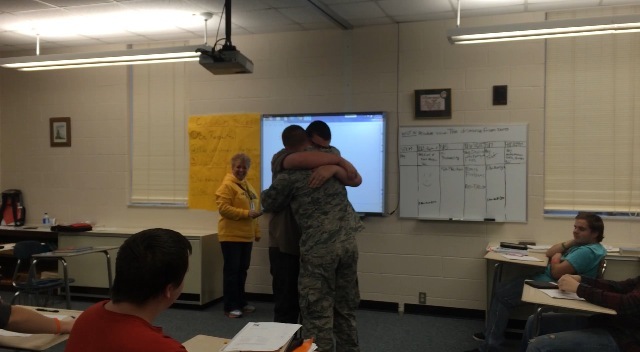 The surprise started when Assistant Principal Mrs. Laurie Kantz interrupted the class and said, “I think there’s someone here you’d like to see.” In the doorway stood Logan’s older brother, Jordan. Jordan had been released from the Shaw Air Force Base located in South Carolina where he is an Air Traffic Controller with an Airman 1st Class rank. Jordan’s break from service stretched from Wednesday Nov. 26 through Monday Dec. 1, giving him time to spend with his family and close friends over the Thanksgiving holiday season. On Tuesday Nov. 25, the day before Jordan surprised Logan at the school, Jordan called his brother to trick him into thinking he wouldn’t be able to make it for Thanksgiving. “I was surprised because I talked to him the day before and he said he wasn’t coming, but he really was in the car on his way up here at that time,” said Logan.